While exploring an unmapped sector the Enterprise is hailed by a voice declaring the area to be owned by the Melkotians and demanding their immediate departure. Kirk ignores the warning and, after assuming a standard orbit around the planet Melkot, beams down with Spock, Scotty Chekov and McCoy. They arrive in the middle of a thick fog where a Melkotian appears before them telepathically communicating to them the fact that they will be punished for ignoring the warning. The fog clears and they find themselves in what appears to be the wild-west town of Tombstone. They also discover that their phasers have been replaced with western-style pistols and that they are to be forced to re-enact the gunfight at the O.K. corral as the Clantons, who were the losing side. A saloon keeper tells them that the Earps are planning on a showdown at 5 o'clock so, to avoid the confrontation, the landing party attempt to leave town but discover that it is surrounded by a force field preventing them from doing so. Kirk comes up with the idea of knocking out the Earps with tranquilisers until after the deadline has passed and McCoy is sent on an errand to collect the materials needed. He heads for the local doctor's surgery that also happens to be the barber and dentist, engaging the local practitioner in 'shop talk', eventually finding out that the proprietor just happens to be 'Doc' Holliday. Meanwhile, the others get themselves unavoidably involved in an early skirmish with the Earps where Chekov is shot and killed. Spock maintains that this gives the rest of them some hope as the character Chekov was 'playing' was not supposed to be killed until the actual gunfight took place. This proves that the scenario does not have to rigidly follow the actual lines of the historical event and that they may be able to change the outcome. McCoy's tranquilisers fail to have any effect on the Earps so the three of them just decide to sit it out until after the deadline but as 5 o'clock strikes they are transported by the Melkotians to the site where the showdown is to take place. 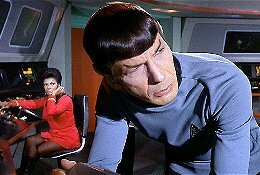 Spock has come to the conclusion that the events they are experiencing are not real but are being placed in their minds by the aliens. He performs mind-melds with the other two, convincing them of the lack of reality in the situation and allowing them to believe that they will be immune to the imaginary bullets. 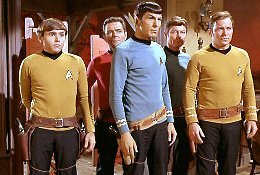 When the shootout occurs, Kirk and the others refuse to fire on their opponents and when, thanks to Spock, the Earps' gunfire leaves them unharmed the scenario around them disappears. The Melkotians contact them again and are persuaded by both Kirk's words and the actions of the group that the Enterprise and her crew are on a peaceful mission. They allow the landing party to return to the Enterprise where they are pleased to find a very much alive Chekov. A Melkotian device that has been shadowing the Enterprise orbit suddenly becomes unstable and explodes, following which the Melkotians appear on the main viewscreen advising Kirk that they are prepared to discuss the opening of diplomatic relations with the Federation.